This interesting Navona CD showcases four recent works for large ensemble. Unfortunately no programme notes are included. An online source is referenced, but again information is lacking in biographical details of the composers or performers. 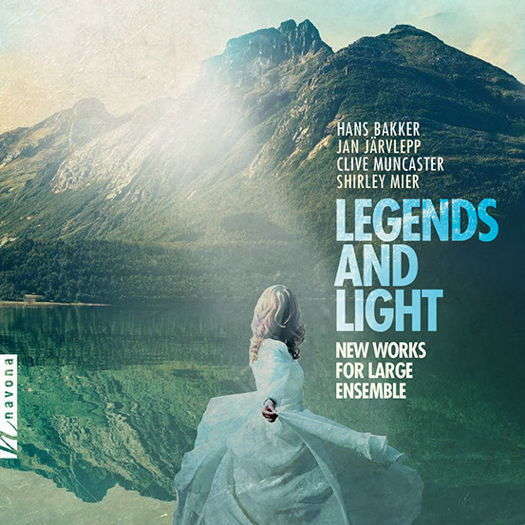 The first work, Canzona III - Hidden in Her Light by Dutch composer Hans Bakker (born 1945) is, for me, the most interesting of the works presented. Described as a hymn to the sun, it is divided into three sections and is performed by the Moravian Philharmonic Orchestra directed by Petr Vronský. The first section starts suddenly with a few chords before a more melodic theme presents itself. On my sound system, the recording is somewhat woolly, and it would have been nice to have a little more clarity and depth here. Contrasts between the various sections of the orchestra are well explored. This movement is resolute and a little grim, but certainly compelling. The more lighthearted second section, marked Allegretto, is in the form of a short waltz and displays an interesting palette of sound. Like a lot of waltzes, it's a little bitter-sweet. The final section, an extension of the waltz tune, is somewhat grotesque. It develops into the thematic material of the first section. The diverse and interesting music of Canadian composer Jan Jäarvlepp (born 1953) is beginning to be performed quite often. This Suite for Strings, in four movements, is played by the same orchestra, and the director is Stanislav Vavřínek. The first movement, 'Changing Times', is short, bright and carefree. Again the woolliness in the recording is quite evident in this piece. 'Shifting Cargo' explores the tension created by a phrase repeated over various octaves, and at different pitches. The third movement, entitled 'A Thoughtful Moment', is the longest, and my favourite. Somewhat elegiac in nature, it has a heaviness and darkness to it which is compelling, and reminds me a little of Grieg. Lastly, 'Dance of the Monkey Man', lively and syncopated, will be enjoyed by all but the most jaded listener, and fully dispels the sombre mood of the preceding movement. Clive Muncaster (born 1936) is from the UK, but has been domiciled in the US for many years. His suite for strings Redcliffe Gardens, in five movements, is presented by the same forces as the previous piece. The first movement, 'Petronella', is very expressive and romantic, with lush harmonic progressions. It presents quite a gamut of emotions, and contains elements of Delius and lighter English string music. This very engaging music is ideal for a string ensemble, feels very English, and at times also has a Spanish-like motif. The sensitively felt 'Pastorella', more reflective in nature, mixes major and minor chords and phrases for a kind of bitter-sweet feeling. The short 'Stella', next, is a gentle intimate dance, with a soaring upper string melody. 'Fuga Romantica' has a lush subject and, as the fugue advances, so does the tension, although this is not sudden or dramatic, perhaps to illustrate the complexities of love. This beautifully constructed movement is waltz-like in places. The last movement, 'Girandole', skips merrily along until the languid middle section, after which the opening melody returns to the gay flavour to round off this delightful little suite. The last composer is Shirley Mier, born in 1966. Of lakes and Legends, in four movements, and with a diverse range of subjects, is performed by the Croatian Chamber Orchestra and conducted by Miran Vaupotić. Each movement in this suite is set at White Bear Lake in Minnesota, USA. The first movement, 'Legend of the White Bear (Manitou Island)', depicts a tragic love affair based on Indian legend. The mood is set by a subdued and slightly ominous beginning. This gives way to a tender theme, later becoming more tense. The music is evocative and easy to enjoy and listen to. A timpani roll signals a battle between the warrior and the bear, resulting in them both being mortally wounded. As the music quietens down, the protagonists are transformed into legend. 'Ride on the rails' depicts a train ride through the lovely, grand scenery around the lake. This happy piece captures the relaxed excitement of the passengers. 'Parlor Recital (Fillebrown House)', gentle and nostalgic, and a delight to the ears, conjures up an intimate piano recital. Often here the melody is played by pairs of instruments weaving together. Lastly, 'Regatta (White Bear Yacht Club)', opens with a feeling of anticipation before a yacht regatta and its onshore celebrations are depicted in a spirited kind of gigue. Again, a feature here is the pairings of instruments, particularly in the woodwind. All pieces on this disc are varied and the performances are satisfying. It is a pity therefore that the quality of the recordings is not a bit clearer and less muddy, as this spoils an otherwise very enjoyable disc.